The Sword of Pac can be found at the center of a vast labyrinth crawling with undead. A longsword of this caliber adds +1 to hit and +1 damage on a successful hit. The Sword of Pac also deals an additional 1d6 damage to undead or 1d10 if the undead creature is a ghost. 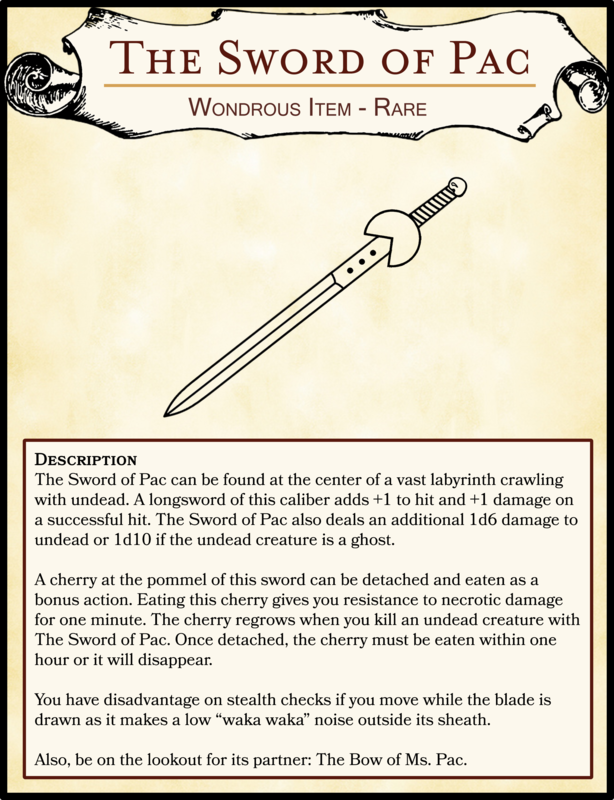 A cherry at the pommel of this sword can be detached and eaten as a bonus action. Eating this cherry gives you resistance to necrotic damage for one minute. The cherry regrows when you kill an undead creature with The Sword of Pac. Once detached, the cherry must be eaten within one hour or it will disappear. You have disadvantage on stealth checks if you move while the blade is drawn as it makes a low “waka waka” noise outside its sheath. Also, be on the lookout for its partner blade: The Sword of Ms. Pac. It is exactly the same, but has a bow.